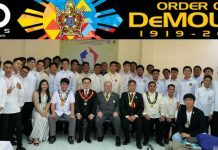 Gen. Douglas MacArthur DeMolay Alumni Chapter No. 5 under the jurisdiction of the DeMolay Alumni Association of the Philippines conducted their installation of officers for 2018-2019 which held last June 23, 2018 at the Scottish Rite Temple in Manila. 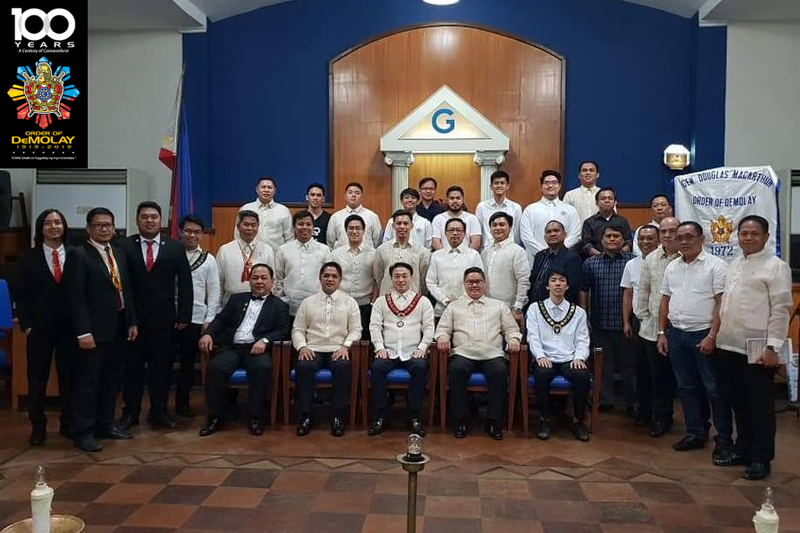 Brother Chevalier Albert V. Manlulu was installed as Chapter President, together with the other officers, namely: Brother Ricarte B. Abejuela III as Vice President, Brother Donnie P. Cordero as Secretary, Brother Mark Henson S. Tio as Treasurer, Brother Chevalier Martin Rowan N. Labro as Auditor, Brother Quintin Cyril L. Parrilla as PRO, and Brother Henry G. Eduarte as Chaplain. Hon. 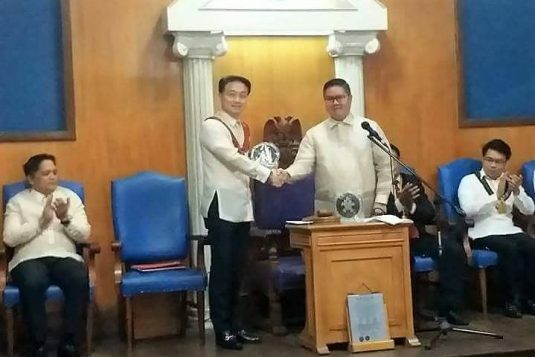 Edison Abella, Grand Master of the Supreme Council, Order of DeMolay, attended the affair as the Guest of Honor and Speaker. 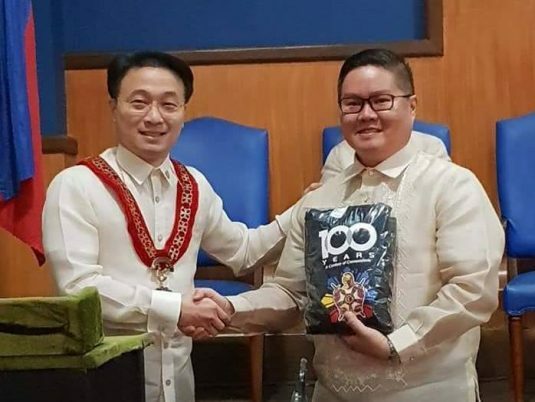 After his speech, Grand Master Abella gave Brother Albert Manlulu the official DeMolay Centennial T-Shirt. 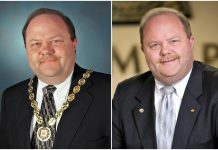 He also awarded Brother Chevalier Ike Amor, Immediate Past President of Gen. Douglas MacArthur DeMolay Alumni Chapter No. 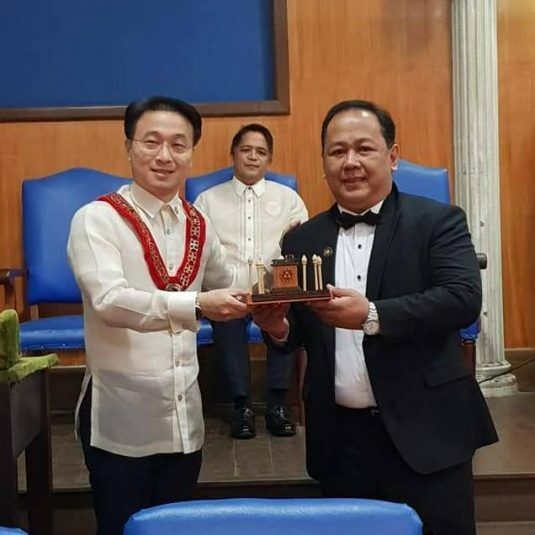 5, with an intricate wooden replica of the DeMolay Altar for spearheading several important projects and events during his term as Chapter President. 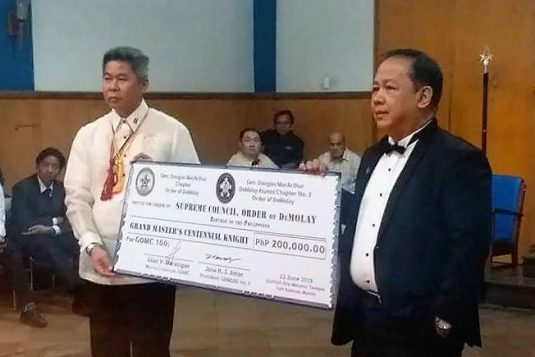 Before the conclusion of the installation ceremony, Brother Legionnaire Ericson B. Atanacio, Chairman of SCOD’s DeMolay Centennial Anniversary Committee, and Brother Chevalier Ike Amor presented to Grand Master Abella with a replica cheque addressed to the Supreme Council, Order of DeMolay in the amount of P200,000.00 representing its contribution and membership to the Grand Master’s Centennial Knight. 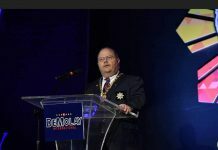 The Grand Master’s Centennial Knight is part of the DeMolay Crusades, which are once-in-a-lifetime membership categories offered for a limited period to a select group of individuals and organizations, who champion the worthy cause of character building and leadership development among the youth and are willing to make an investment to their future. 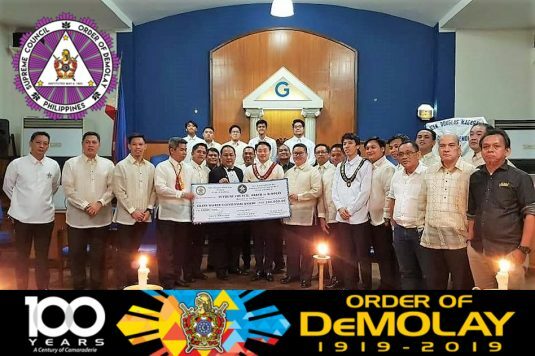 The other membership categories are the Frank S. Land Centennial Fellows for Master Masons, Jacques DeMolay Centennial Fellows for Senior DeMolays, and Louis Gordon Lower Centennial Fellows for Active DeMolays. 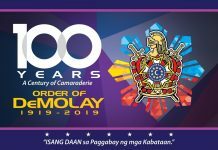 The DeMolay Crusades is one of the major projects and activities of the Supreme Council in support of the worldwide celebration of the 100th Year or Centennial Founding Anniversary of the International Order of DeMolay in March 2019. 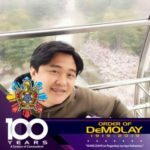 Donations to the DeMolay Crusades shall establish the first ever Philippine DeMolay Trust Fund that aims to promote and sustain the growth and expansion of the DeMolay Movement in the Philippines in the next 100 years.